Blossom, seeds and root are used. First year root can be used for food. Wild carrot. Root grated used for sores, acne, blemishes, and risins. Also used to treat cancerous sores, skin cancer and bedsores. Expels intestinal worms. Stimulates menstruation. Diuretic, a weight loss aid. Type II diabetes. Aids endocrine system disorders. Useful for gout, to clean out the liver, to relieve the body of excess fluid and to ease arthritis. Used for heart dropsy, liver dysfunction, painful urination, indigestion, colic and to break and expel stones. Clinical research has shown Queen Annes Lace to be a mild laxative, antispasmodic and useful for coronary deficiencies. Anti-cancer. Anti-bacterial. Aids the body in absorbing nutrients better. Reported as a morning after contraceptive in Appalachia. Key Uses: diuretic, weight loss, hormone balancing, heart problems, endocrine system. 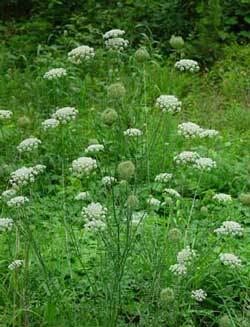 Caution: Do not confuse Queen Annes Lace with Poison Hemlock in the wild. Helps remove uric acid deposits in the joints. Helps clear the body of toxins and waste. Diuretic. 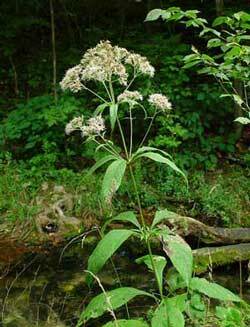 Used for gout, rheumatism, and inflammatory distress. Aids in removal of kidney stones and gravel. Also called gravel root. Used to treat urinary problems, gout and cystitis. Good for aching or sprained back. Strains, sprains and pulled ligaments and tendons. Key Uses: bursitis, dropsy, gallstones, kidney, neuralgia, rheumatism, water retention, kidney stones.